A friend of mine was fishing the kayak tournament at Decker this past Saturday and, apparently, the TPWD Game and Fish Wardens and State Troopers took one of the participants of the tournament away prior to weigh-in. Does anyone have any knowledge of what took place? The rumor is it was for cheating instead of an on water violation like missing fishing license or missing PFD but I haven't heard anything definitive. Cheating or they may have had outstanding warrants and someone tipped off the Game Warden on-site. I didn’t find anything recent using Google. I was reading about it online among some of the participants but it looked like until all the facts were out most were keeping quiet. A good rule of angling philosphy is not to interfere with another fisherman's ways of being happy, unless you want to be hated. My buddy Brent Taylor would never cheat. I heard he was cutting his first fish in half and laying it across the next four fish and covering the cut with his hand, making the fish look longer in the pics. I think he was set up. Why else would four game wardens be waiting at the gate to move in on him. It's almost like he had done it before and they were waiting on him. No way. The fix is in. That's a new one. Any pictures? Interesting, can't find anything on the internet. Cutting a fish in half and using the tail end to make other fish longer? Seems extreme, and easily caught given the number of participants at KATS. I saw comments regarding this issue on Facebook, but the photo that had been posted on Facebook had been removed due to the investigation being ongoing. According to the comments on Facebook, he was cutting the tail off his first fish and then using the tail to make subsequent fish look longer and had done so in several tournaments for several years. The photos were eventually noticed as being suspicious when they were posted online on the TourneyX webpage and brought to the attention of the Tournament Director. Apparently he cheated again at the Decker tournament and was caught red-handed with the tail and photographic evidence according to what I read on Facebook. I'm sure we'll hear more about this once the investigation is completed, but it amazes me to what extent people will go to win $1K. Now that a kayaker has won $100K in a tournament, there will probably be other folks who will come up with a way to cheat as well. I think the next evolution of cheating will be photoshop between an angler on the water using his phone to photograph fish and an accomplice with a computer at home sending photos back and forth to each other which is pretty easy to do with phones. I think using cameras would at least stop the photoshop issue. seriously... someone was cutting a fish into and trying to make it look longer. wow.... what a scumbag. From what I read on Facebook, he was not cutting the bass in half but, he was cutting the tail off and using just the tail to make the rest of his fish look longer to win the tournaments. I almost shiot when I read the name up above. I'd been reading about it online and the the discussion I was reading had already been sanitized with the pictures removed. Sad deal as I consider the guy a friend and have known him for several years. You just never know what folks will do to win. That's crazy....that boy needs to get his compass set right. 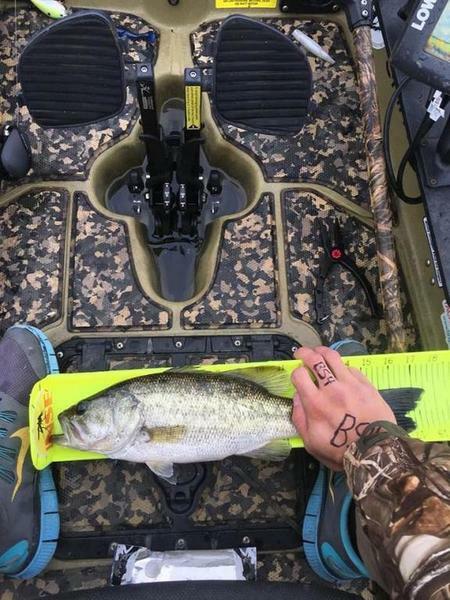 If that’s the person in question, he does have a habit of photographing his fish on a measuring board and holding it down on the tail, according to an Instagram account of a guy with the same name, who also appears to compete in kayak bass tournaments. Did he used to live in Montana? Some guys are just too clever for their own good.